If you hurried inside to warm your toes after skating Winnipeg’s river trail this winter, you may have noticed changes taking place at The Forks Market. Throughout the winter season, temporary walls have covered much of the central atrium, but now that spring has arrived, the public is finally getting a chance to see behind these walls as a new vision for The Forks Market is taking shape. 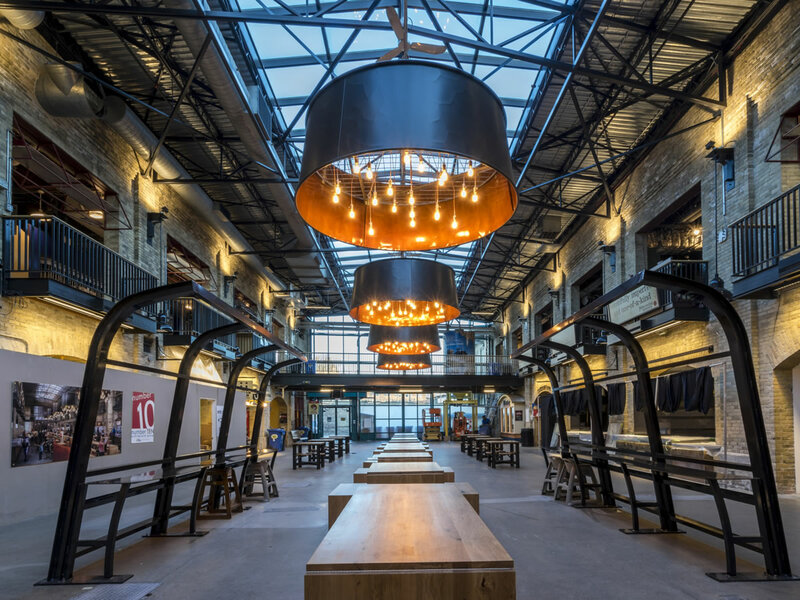 In the Spring of 2014 Number TEN Architectural Group was approached by The Forks to revitalize The Forks Market by transforming the central atrium in to a food hall. The food hall concept allows visitors to experience diverse local cuisine in a casual environment. Menu items can be selected from a variety of kiosks and paired with beer and wine. Knowing how close Winnipegers hold The Forks to their hearts, re-imagining the market was a daunting challenge for Number TEN. All of Manitoba became our client, and we did not want to disappoint. The market acts as the city’s living room, a place for people to gather and relax with their friends and loved ones. While developing the design, we felt it important to support both the evolving functions of the public space and the site’s rich history. For hundreds of years The Forks has been a place for both gathering and trade. From the late nineteenth century onward, the site was used as a rail yard. The two brick structures that today form the market were once planned to be machine shops for freight car and coach repair, and later stables for the rail companies. An atrium space was constructed in the late 1980s linking the two historic structures to create The Forks Market building, establishing the shopping and dining destination that we all love today. The Forks' industrial past inspired the direction of the interior design. Raw steel, hand-forged blacksmith work and natural wood detailing are all used to reinforce the character of the historic architecture. An exposed steel structure inspired by the architectural language of Canada’s rail history stretches over the beverage kiosk. Hand-forged steel detailing by a local blacksmith references a traditional industrial art. The familiar teal colour was painted dark grey and new lighting was added to emphasize the character and material of the original stable buildings. New tables with steel bases and swinging circular seats reflect factory plant benches, further relating to the Forks as a place of turn-of-the-century industry. The design aims to enhance the sense of community in The Forks Market’s central court. Smaller wood tables with hinged drop leaves can transform into an 80-person harvest table, allowing for large communal gatherings. Arched structures for counter seating and upholstered banquettes line the edge of the hall. These features attempt to lower the volume of the space, creating a sense of intimacy. Glowing from above, large metal drum pendants provide visual warmth and help to define the gathering space. The Forks has acted as a space for gathering and commerce throughout its history. Our hope is that the refreshed food hall will breathe new energy into the space, helping this tradition to continue long into the future.